“The Getaway” resort is on the ocean-side of The Great Ocean Road, in Aireys Inlet, en-route to the famous Twelve Apostles. 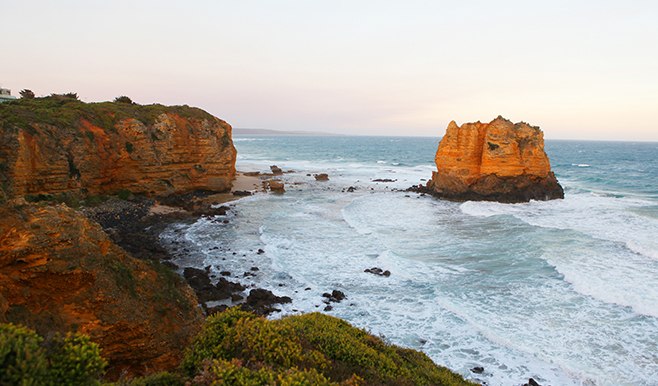 The road winds above the rugged cliff tops and wide sandy beaches for over 100 kilometres leaving the ocean briefly to pass through the Otway ranges and rainforests. You can’t miss Aireys Inlet, it’s famous “great white lady”, the Split Point Light House, acts as a impressive landmark, to this somewhat, relaxed, romantic, arty, laid back, family friendly, small beachside town. The impressive beauty of nature, a native forest on one side and the beautiful blue ocean of the Bass Strait on the other surround the Aireys Inlet Getaway Resort. “The Getaway” is within minutes to some of natures most impressive, marine and national parks, five beautiful beaches, the wonderful child friendly Inlet and Fairhaven beach and lifesaving club, which is a patrolled beach during the summer periods, Allan Noble sanctuary, fabulous cliff top walks etc. Ramble and mermaid hunt amongst the many ocean rock pools with the kids, or maybe just enjoy the incredible re-invigorating atmosphere. You can just imagine those magnificent sunsets and beautiful sparsely populated beaches that you can walk along barefoot, with the sand between your toes, hand in hand for miles. The town has a wonderful pub with incredible views to Lorne and great food, a few lovely quaint shops and country friendly businesses, like the wonderful Great Escape Books, an old-fashioned general store, with freshly baked bread and local delicacies and wines, a trendy art gallery, that represents some of the local areas wonderfully talented artists and some fabulous restaurants and cafes, that foodies rave about, all within a 5 minute walk from “The Getaway”, such as “A La Grecque”.